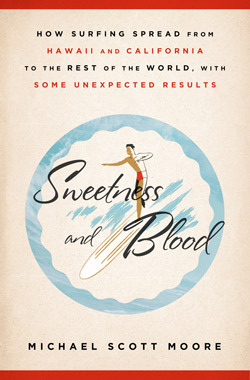 Sweetness and Blood is a folk history of modern surfing, arguably America’s most influential sport. How did an obscure tribal tradition from pre-colonial Hawaii — nearly eliminated by Christian missionaries — jump oceans to California and Australia? How did it become a world sport, and how does it clash with cultures in corners of the earth where the surf might be excellent but the society is highly traditional, or superstitious about the sea? In a series of travel essays, Mike visits a number of surf destinations — Israel, the Gaza Strip, West Africa, Great Britain, Germany, Indonesia, Japan, Cuba, and Morocco — to find out. The result is a surprising look at how modern surfing became a major American export, like Hollywood or rock ’n’ roll, mingling with cultures that should have every reason to ignore a pop phenomenon that started, more or less, in Mike’s hometown. He explores each country with a simple goal: to find out who surfed there first. His wandering introduces him to the roots of the 2002 nightclub bombings in Bali, the challenge to communism posed by surfing in Cuba, and the hazards of surfing an accidental wave in Munich’s municipal river system. “Not since William Finnegan’s definitive New Yorker pieces on the sport has there been a more compellingly written, thoughtful, and affecting look at the call of the wave,” says the jacket copy.